Researchers found that two highly trained dogs were able to detect prostate cancer in urine samples with a combined 98% accuracy. This year an estimated 233,000 men in the US will be diagnosed with prostate cancer this year alone. Unfortunately, the current testing is not always accurate. However, there may be help from "mans best friend" . Italian researchers have found that specially trained dogs were able to detect prostate cancer from urine samples with 98% accuracy. It is well known that dogs have a great sense of smell. 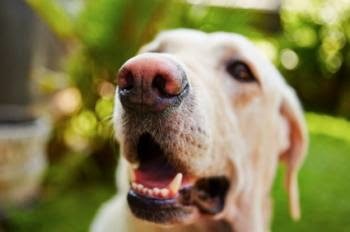 Dogs actually have over 200 million olfactory cells compared to humans 5 million. It is this keen sense of smell that is already being used to help alert diabetics to high or low blood sugars. There has also been studies that are showing great promise in detecting ovarian cancer and bladder cancer. The Italian researchers took a large sample of 677 participants, 320 of which had prostrate cancer at different stages. The trained dogs were able to detect the cancer 99% of the time, while specificity was 97% accurate for a total of 98% accuracy in detection. This has a great deal of implications for pet owners. Can our own pets detect when we have cancer?